"But that was a framework that said judicial review of preventive detention and control orders would be meaningful and I'm concerned that in the drafted provisions that presently exist there are many aspects of normal judicial review that have simply been left out." Mr Debus said he was worried about the lack of open debate about the contentious bill. "I'm also concerned that debate so far has been so secret. I do think that we are talking here about some of the most profound changes to the criminal law that we have known in a generation and, necessary as they may be in general, it is obviously extremely important for democracy that they should be debated in a rational matter, both before they get into Parliament and when they get there - preferably some time well after Melbourne Cup day." 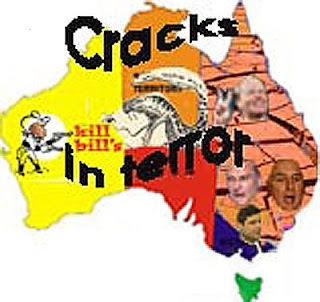 The Prime Minister, John Howard, is pressuring the state and territory leaders to commit to a new version of the counter-terrorism bill by Monday so it can still be introduced to federal Parliament on Tuesday, Cup day. The state leaders were told yesterday a new bill would be drafted following last night's meeting of the state and federal solicitors-general. The bill would be sent to the premiers today with the request that their adviser check the final draft by Monday. But Mr Howard's push is in trouble as a growing number of solicitors-general, senior members of the bar and legal bodies are swaying premiers to take more time to examine the bill, its judicial safeguards and the possibility it will be struck down by the High Court as unconstitutional. The head of the Human Rights and Equal Opportunity Commission, John von Doussa QC, has added his voice to those calling on the Howard Government to delay the introduction of the counter-terrorism laws because of the lack of meaningful judicial safeguards in the current draft of the bill. The commission argues the bill falls short of international human rights laws. Mr von Doussa said yesterday that the laws needed to meet "basic guarantees" of human rights that a suspect who is detained for preventive detention or placed under a control order can challenge the action in court without delay. "The current force of the bill simply fails to meet these basic guarantees." The NSW and ACT governments have raised similar concerns in a submission sent to the Federal Government, which were to be discussed at last night's meeting. The Queensland Premier, Peter Beattie, told his Parliament yesterday the legislation had to be correct in its detail. "There's no point to the states agreeing to laws that could effectively be challenged in the High Court."